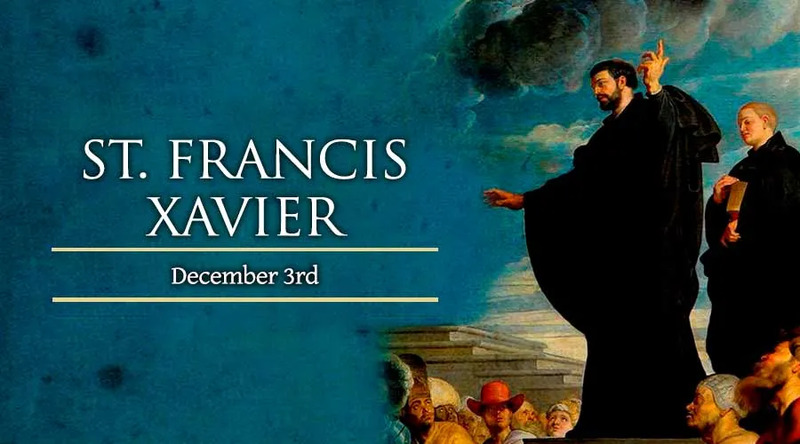 On Dec. 3, the Roman Catholic Church honors St. Francis Xavier, one of the first Jesuits who went on to evangelize vast portions of Asia. Francis Xavier was born during 1506 in the Kingdom of Navarre, a region now divided between Spain and France. His mother was an esteemed heiress, and his father an adviser to King John III. While his brothers entered the military, Francis followed an intellectual path to a college in Paris. There he studied philosophy, and later taught it after earning his masters degree. In Paris, the young man would discover his destiny with the help of his long-time friend Peter Faber, and an older student named Ignatius Loyola – who came to Paris in 1528 to finish a degree, and brought together a group of men looking to glorify God with their lives. Gradually, Ignatius convinced the young man to give up his own plans and open his mind to God's will. In 1534, Francis Xavier, Peter Faber, and four other men joined Ignatius in making a vow of poverty, chastity, and dedication to the spread of the Gospel through personal obedience to the Pope. Francis became a priest in 1537. Three years later, Pope Paul III confirmed Ignatius and his companions as a religious order, the Jesuits. During that year, the king of Portugal asked the Pope to send missionaries to his newly-acquired territories in India. Together with another Jesuit, Simon Rodriguez, Francis first spent time in Portugal caring for the sick and giving instruction in the faith. On his 35th birthday, he set sail for Goa on India's west coast. There, however, he found the Portuguese colonists causing disgrace to the Church through their bad behavior. This situation spurred the Jesuit to action. He spent his days visiting prisoners and the sick, gathering groups of children together to teach them about God, and preaching to both Portuguese and Indians. Adopting the lifestyle of the common people, he lived on rice and water in a hut with a dirt floor. Xavier's missionary efforts among them often succeeded, though he had more difficulty converting the upper classes, and encountered opposition from both Hindus and Muslims. In 1545 he extended his efforts to Malaysia, before moving on to Japan in 1549. Becoming fluent in Japanese, Francis instructed the first generation of Japanese Catholic converts. Many said that they were willing to suffer martyrdom, rather than renounce the faith brought by the far-flung Jesuit. St. Francis Xavier became ill and died on Dec. 3, 1552, while seeking a way to enter the closely-guarded kingdom of China. In 1622, both St. Francis Xavier and St. Ignatius Loyola were canonized on the same day.